1/4 cup crumbled feta cheese. 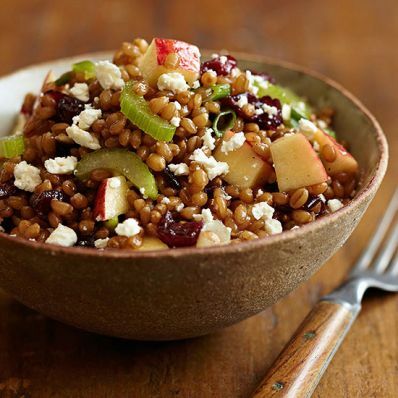 1 of 1 Combine 3 cups cooked wheat berries; 1 can (15.5 oz) blackeyed peas, drained; 1 Lady Alice or Gala apple, cored and cubed; 1/2 cup dried cherries or cranberries and 1 rib celery, sliced, in a large bowl. Add 1/2 cup light balsamic vinaigrette and 1/4 cup crumbled feta cheese. Toss with 1/4 tsp each salt and pepper.